Happy Christmas everyone! I hope your holiday has been, and will continue to be filled with love, joy, family, friends and endless layers of sweetness like this fluffy carrot cake. Carrot cake isn’t necessarily a conventional Christmas dessert, not like a steamed pudding or trifle anyway, but it does make a nice addition to the holiday feasting because it incorporates a lot of the foods we associate with the holidays. The delicate layers of cake are full of sugar, spices, nuts, fruit and shredded carrots layered between thick, creamy cream cheese frosting for a smooth and satisfying finish to any holiday meal. It’s not overly sweet and can be a welcome change to some of the sweeter desserts being whipped up right now. Though I usually wrap the whole cake in frosting, this time I wanted to cut back on the richness a little and thought I’d just layer the cake with frosting and top it off with a sprinkle of powdered sugar. I placed a doilie upside down on top of the cake and sprinkled powdered sugar with a little sifter around the edges until the holes in the doilie were covered. The result was a pretty outline of the doilie to decorate the cake, without the heaviness of a lot of cream cheese frosting. My family was delighted with the results as they raved about the rich and satisfying taste of the cake without some of the extra calories that usually come with a lot of frosting. Wrapped entirely in frosting or filled just between the layers, this carrot cake is a delicious way to entertain family or friends during the holiday season because the ingredients can be adjusted to suit your preferences by changing golden raisins for dried currants, shredded coconut (my personal favorite) or pineapple chunks. My sincere best wishes for a wonderful year of sweetness and joy! 1. Center an oven rack and preheat the oven to 350 degrees F.
2. Sift together the flours, baking powder, soda, salt, ginger, cinnamon, and nutmeg in a bowl, then whisk the mixture by hand to ensure that the ingredients are well mixed. 3. In the bowl of a stand mixer fitted with the paddle attachment, combine the sugars with the oil on low-speed until the mixture resembles wet sand. As you make the batter, stop the mixer frequently and scrape the paddle and the sides of the bowl with a rubber spatula. Add the eggs one at a time, adding the next one as soon as the previous one has disappeared into the batter. Increase the speed to medium-high and blend for 3 minutes. The thick batter will increase in volume and lighten in color. With the mixer on low-speed, add the flour mixture in three parts, alternating with the buttermilk in two parts, beginning and ending with the flour. After each addition, mix until just barely blended and stop and scrape the bowl. Stop the mixer before the last of the flour has been incorporated and complete the blending by hand with a rubber spatula to ensure you do not over-beat the batter. Fold in the carrots, golden raisins and the walnuts. 4. Divide the batter evenly between four prepared pans. Place the pans in the center of the oven and bake until the cakes are golden and spring back when lightly touched in the middle, 20 to 25 minutes. 5. Promptly run a knife around the edge of the pan to help the cake retract evenly from the sides while cooling. Cool the cakes in their pans for 10-12 minutes, taking extra care as they are fragile and could crack. Leave them to cool on the rack, top side up, until they reach room temperature and you are ready to assemble the cake. 6. To assemble the cake, place one of the layers, top side up, on a serving plate. If the cake is domed in the middle you may need to use a serrated knife to trim off the domed area. Using a metal spatula, spread one-third of the frosting over the cake, spreading it slightly to the edge. Place the next layer of cake, top side down, on top of the frosted layer, remembering to trim any excessive doming first, if necessary. Repeat again, ending with the last layer placed top side up on the frosting. Place a doilie upside down on top the cake and press it down until it sticks slightly. Fill a small sifter with a tablespoon of powdered sugar, taping it gently with your hand over the edges of the doilie until you have gone all the way around. Carefully remove the doilie by lifting it gently up and away from the cake and you should have a lovely decorative pattern that will last for several hours. If left overnight the powdered sugar will be absorbed into the cake so if you are entertaining, it may be best to leave this part until just before your guests arrive. This cake is fabulous the day it’s made but can be kept fresh for up to 2 days in an airtight container in the refrigerator due to the frosting. Allow at least 1 hour for the cake to come to room temperature before serving. I’ve also frozen this cake with great results. Just let it defrost at room temperature and serve. 1. In a large bowl, beat together the butter and cream cheese with an electric mixer. With the mixer on low-speed, add the powdered sugar a cup at a time until smooth and creamy. Beat in the vanilla extract. One of my favourite things to make around the holidays is a pavlova. A pavlova is a round, pie shaped meringue, filled with curd or custard and topped with cream and fruit. It’s positively delicious. Last year I made one my mother-in-law loves to make, called angel pie. It’s a white meringue, filled with lemon filling and topped with whipped cream and fresh fruit. I’m sure it’s called angel pie because it tastes so heavenly. 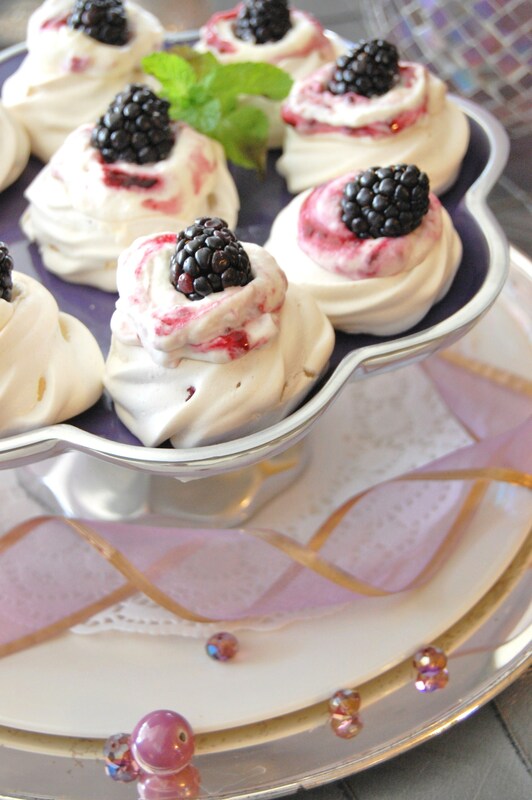 Looking for holiday dessert ideas, I was flipping through a 2010 Food & Drink Magazine from the LCBO, when I saw a recipe for individual meringues filled with blackberry jam and whipped cream. I just knew I’d have to try them. The meringues are quite sweet, with a crispy outer shell, and a nice and chewy marshmallow texture on the inside. In this desert, the sugary sweetness of the meringue, is balanced by the whipped cream and little pockets of blackberry jam filling. 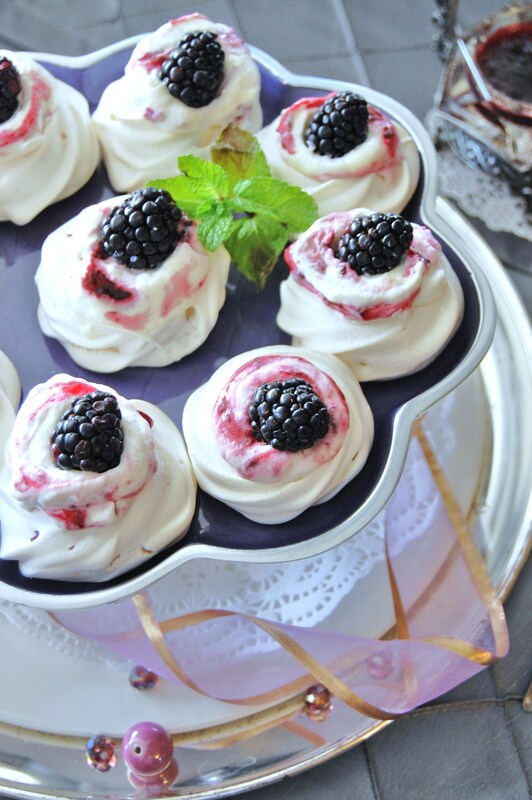 The burst of fresh blackberry on the top, cuts through the cream and meringue and cleanses your palette, for a nice clean finish. The result is a really delicious and satisfying desert that may seem simple, but really delivers through layers of tastes and textures. You have the outer crunchy shell of the meringue, followed by a soft chewiness of the centre, filled with a smooth whipped cream flavoured with vanilla, that’s complimented by ribbons of blackberry preserves, and topped with a luscious berry bursting with natural juice and sweetness. The recipe originally called for bits of white chocolate and vanilla in the meringue but when I added them, the meringue lost it’s thickness and I ended up with meringue puddles when I piped it onto the parchment. So I started over with just a plain meringue, of egg whites, sugar and cream of tartar. Once I did that, I was able to pipe the little nests without any trouble at all and they stayed up nice and high so that the filling could easily nestle inside, with the jam. The trick to these meringues is to keep the jam and whipped cream separate until they are being piped into the meringue. That way you get layers and pockets of jam, instead of a uniform purple blackberry cream, which is fine too, but if you want the two-tone texture you see in my photos, you don’t want to over mix them. A fold or two, before filling the pastry bag should be enough. And remember, once the blackberry jam and whipped cream are pushed through the pastry bag in order to fill the nests, they will mix together even more. 1. Preheat oven to 200 °F (105 °C). Line a baking sheet with parchment paper. Set aside. 2. In a large, especially clean bowl, use an electric mixer to beat whites on low-speed, until foamy. As the whites begin to whiten and foam, add the cream of tartar and beat on medium high-speed until soft peaks form. Add the superfine sugar, also commonly referred to as castor sugar by the spoonful (I used Instant Dissolving Sugar, by Redpath, because it was the only superfine sugar I could find, and it dissolves instantly when added to moisture. Instant Dissolving Sugar by Redpath, used to be called, Fruit Powder Sugar). Beat well after each addition until all of the sugar has been incorporated, the whites are stiff and glossy and when you press a bit of the mixture between your thumb and index finger it doesn’t feel gritty, about 6 minutes. 3. Spoon half the mixture into a piping bag (I used a Wilton 14″ Piping Bag ) fitted with a swirl piping tip (I used Wilton tip #1M). 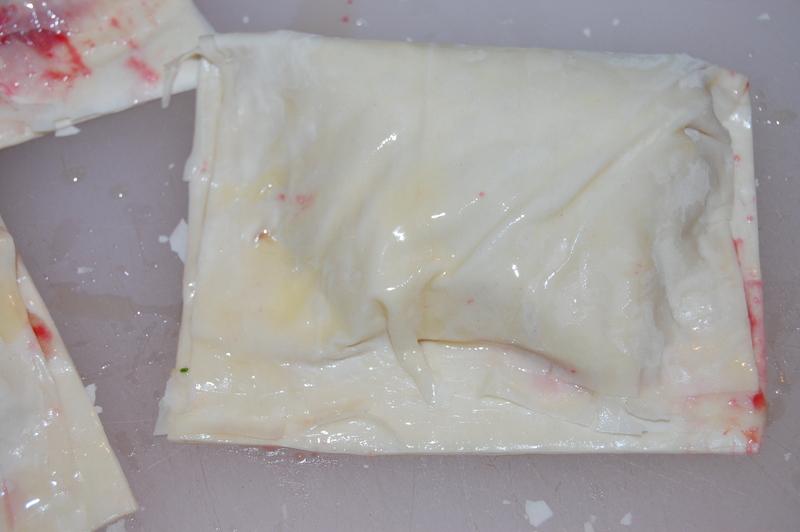 If you don’t have a pastry bag you can make one by cutting a corner off of a large plastic ziplock bag. Pipe the mixture into a 1-inch (2.5cm) rosettes, in rows onto the prepared baking sheet, leaving a “nest” in the center of each. Bake in the preheated oven for 50 minutes to 1 hour (the time will vary depending on the humidity of the environment), until they are crisp and dry. Turn off the oven and leave the door ajar until the oven and meringues are completely cool (they are best if left overnight). 4. In a bowl, beat the whipping cream with a whisk or mixer until you see soft peaks begin to form. Add vanilla and sugar and beat again until incorporated and soft peaks are formed. Gently fold in the blackberry preserves with a spatula (being careful not to overmix) and fill a pastry bag fitted with a Wilton tip #2A, half full. 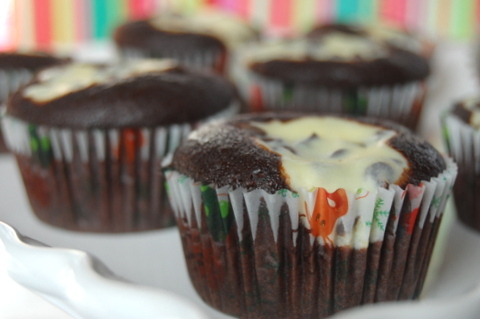 If you don’t have this tip you can use the piping bag without it, just as well. 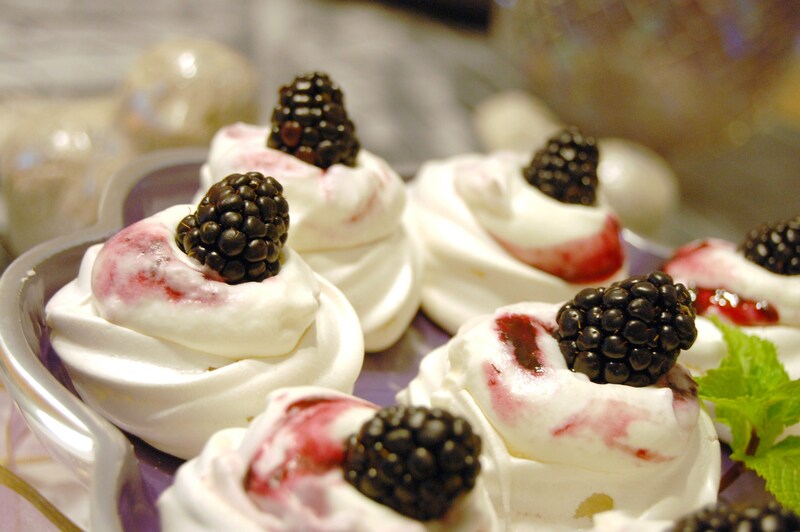 Pipe the blackberry cream into cooled meringue nests just before serving. 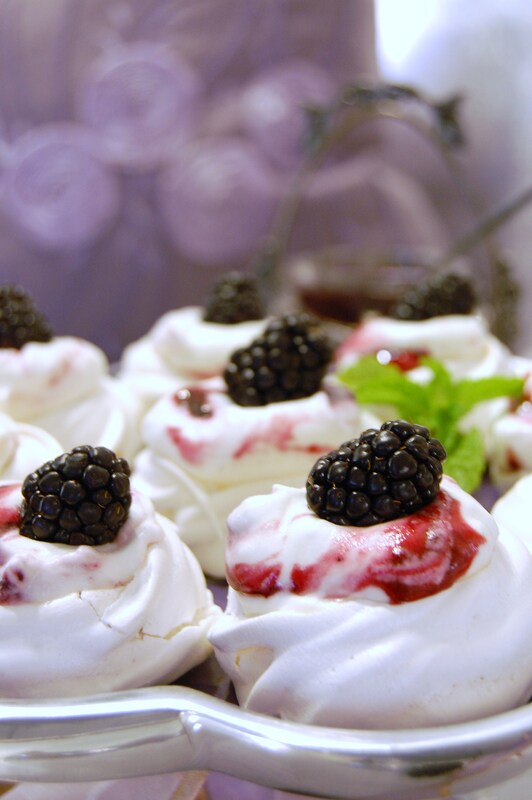 Garnish each meringue with a blackberry and serve immediately. This recipe is very versatile. You can replace the berries and jam with one of your favourite flavours. I think it would be absolutely gorgeous and delicious with strawberries, raspberries, or even peaches. You may want to keep the recipe handy as summer fruits begin to ripen and flavours peak, your family and friends will be delighted. 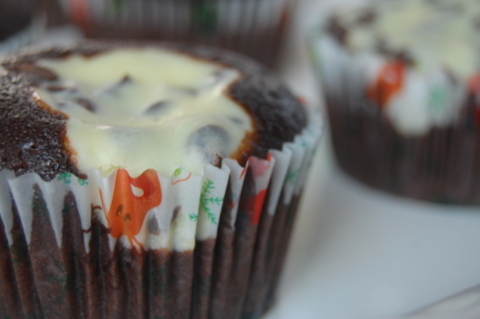 chocolate, cranberries, coconut, pecans or any combination of these. Montreal, Canada. These are her mother’s tarts and the only one’s she eats. If you make them, you’ll be sure to see why. nicely and bakes up flaky, golden and tender. It’s a perfect butter tart dough. butter and lard until it’s in fine pieces with just a few larger pieces. until a ragged dough forms. make enough for 18-24 butter tarts. scraps. 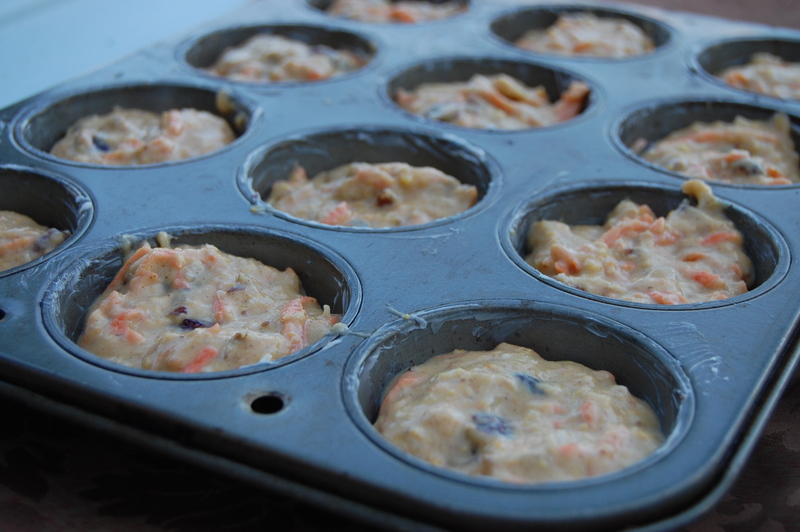 Fit into muffin cups; refrigerate for 30 minutes. 3. Meanwhile, in a bowl, cream together butter and brown sugar until light. pastry shells, approximately 1/4 cup (50 ml) into each shell. single layer in an airtight container at room temperature. 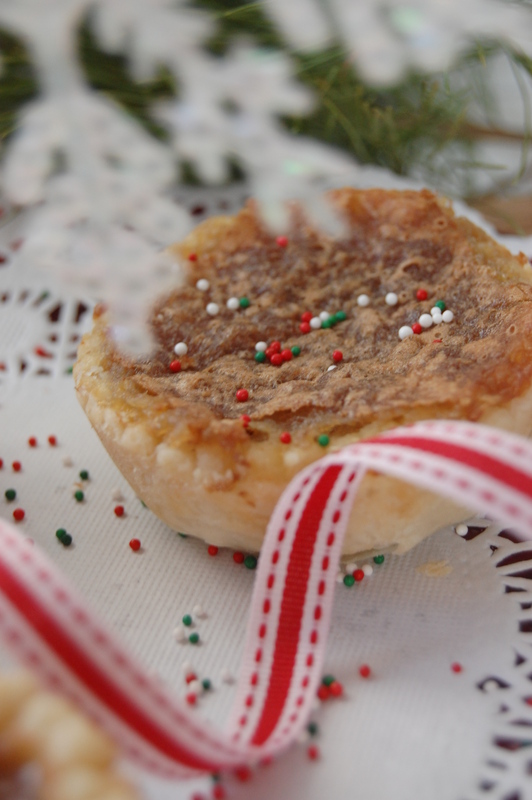 Makes 1 1/2 dozen 2-inch tarts. for a circular tart shell or leave them wavy for a ruffled effect. 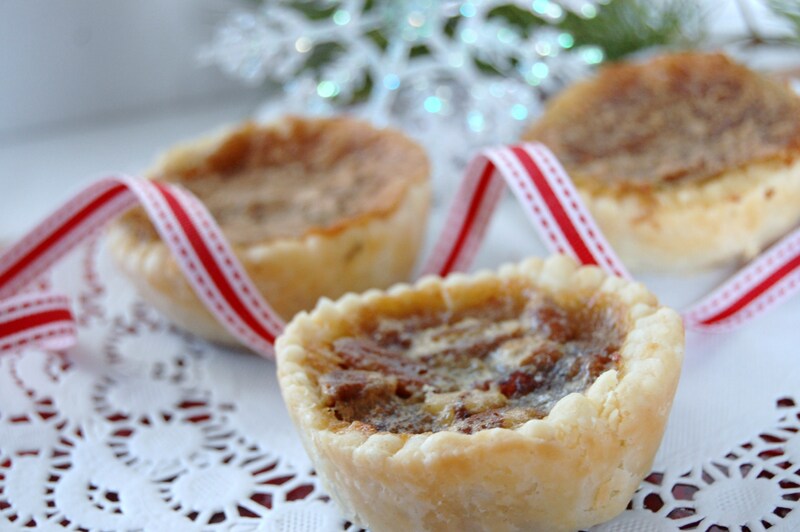 Plain Butter Tarts: omit the raisins, walnuts and toasted coconut. chips, omit raisins, and coconut. raisins, walnuts and toasted coconut. something for everyone! I know I had my fair share. Sshh! That’s all I’m saying about that. cook up the delicious scents and aromas that we love about them. and nuts offer a taste and crunch that are a perfect match for each other. less thing to do once the festivities begin. Hhmmm, that sure sounds good! in thin spots. Freeze while making the filling or for at least 10 minutes. instead of following the one here. hazelnuts. Coarsely chop nuts and cherries. Stir together; set aside. butter together for 45 to 60 seconds or until very hot, but not boiling. Continue boiling sugar mixture until it has turned a deep caramel colour. nuts and cherries; remove from heat and set aside. 4. Remove tart shells from freezer; immediately place in preheated oven. a light pan). Cool; then generously fill with caramel nut mixture. freeze in an airtight container for up to 2 weeks. Makes 3 dozen tartlets. Thanks for the company, and good luck with all your Christmas baking! With the holidays fast approaching, Christmas morning recipe ideas are at the top of my to-do list. Lots of folks will be busy opening gifts and sharing time with their families and no one wants to be stored away in the kitchen and miss out on all the fun. So, while many a strata will be made on December 24th, here’s another idea that will bring a festive dimension to your holiday breakfast that can be made ahead. 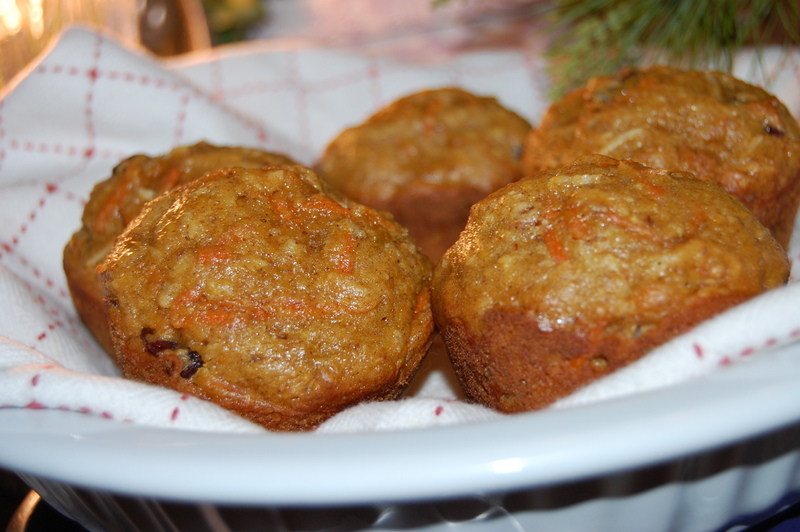 Orange, Cranberry, Carrot Cake Muffins. When it comes to muffins, I’m pretty fussy. I like them moist, with nutritious ingredients, full of flavour and not too sweet. 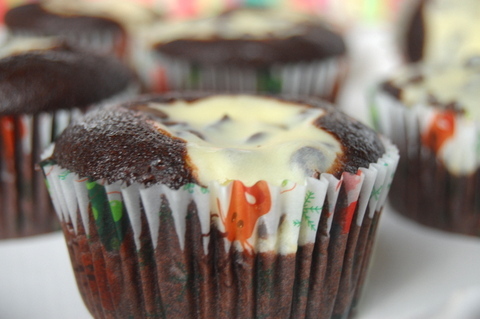 A muffin should not be a cupcake. I don’t think muffins need a lot of sweet, sticky toppings; I think the muffin should be good enough that it can stand alone. I like muffins that work for breakfast, can be packed with a lunch, are great grab n’ go’s, and fill the void between after school and supper. This muffin really fits the bill. 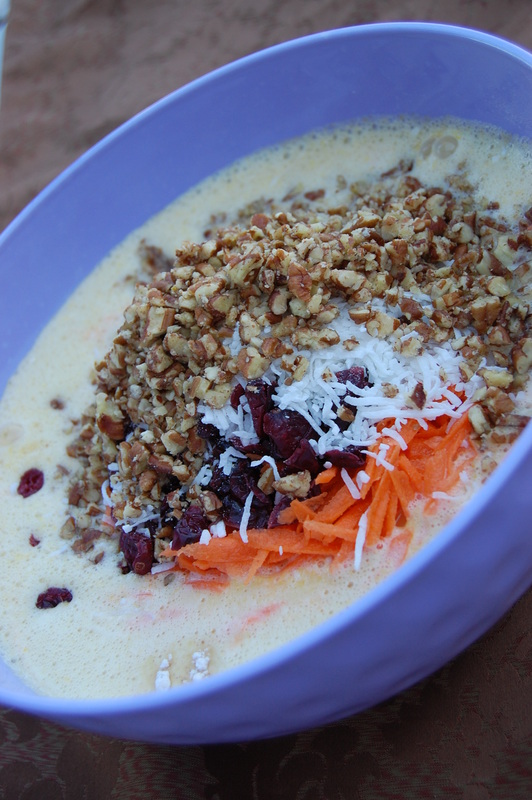 But it also brings a dimension of satisfying holiday flavours in the orange, the cranberries, the carrots, the nuts, coconut and spices that your family and guests will really love. These muffins do not have an oily taste, they’re light and very moist from the use of the whole orange. The fruit and nuts add texture, flavour and good nutrition. Whip up a batch of these muffins over the holidays; prepared ahead,they’ll keep you out of the kitchen and free to enjoy the spirit of Christmas. 1. 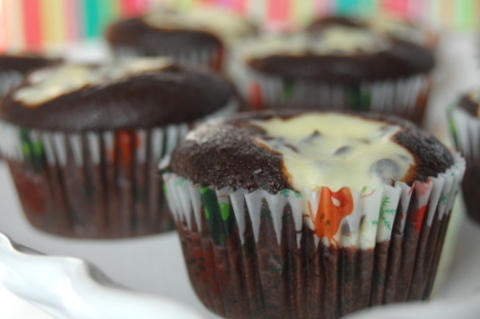 Line 12 muffin cups with paper liners or grease and set aside. 2. In food processor, finely chop the orange. My food processor didn’t chop the orange fine enough for me so I ended up using my hand-held blender. I really ground up the orange to a fine pulp until it was foamy and resembled jam. How much you grind up the orange is really a personal preference. You may like to leave little fine pieces of orange or you can grind it to a foaming pulp like I did. The skin of the orange can be quite strong so if you like a milder orange taste, grind it up well. 2. Scrape the orange into a liquid measuring cup; add enough orange juice to make 1 1/3 cups (325 ml). Scrape into a bowl and whisk in eggs, sugar, oil and vanilla until well mixed. 3. In a large bowl, whisk together flour, cinnamon, baking powder, baking soda, nutmeg, salt; scrape orange mixture over the top. Add carrots, cranberries, chopped pecans and 1/2 cup (125 ml) of the coconut; stir just until the dry ingredients are moistened. Spoon into prepared muffin cups, approximately 3/4 full and evenly distributed (I personally have trouble with this part; too much in some, not enough in another — whatever; don’t fuss, it always works out in the end). Happy Baking ~ I hope you stop by again real soon! finish to a perfect day. to get it out of the bowl. Put all ingredients together in a pot to simmer, stirring frequently. it a couple bursts of power and wham, bam, you’re done. 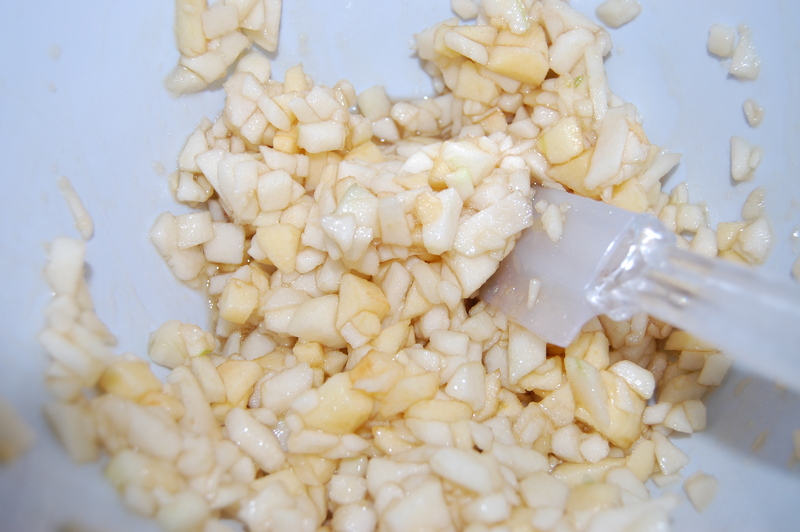 lemon into the apple pieces to prevent browning and add a splash of flavour. Add 1/2 cup (125 ml) brown sugar and 1 tsp (25 ml) pure vanilla. Stir and set aside. broad strokes across the surface. 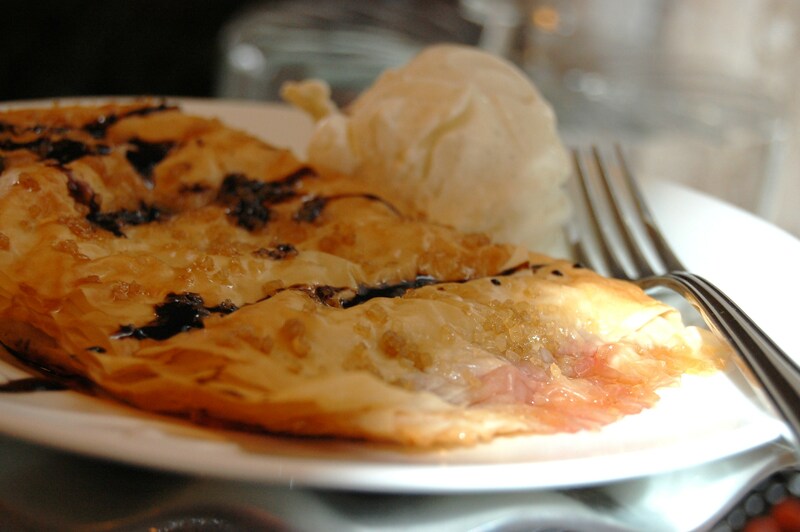 Repeat this 7 more times until you have a pile of phyllo sheets, 8 sheets high. 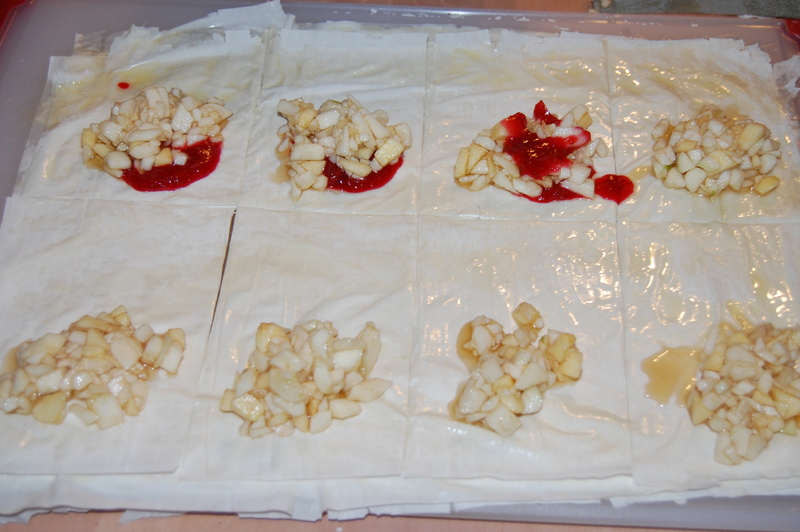 With a sharp knife, cut your phyllo into 8 sections. what I was doing. I do have moments like that … even whole days actually). Brush around the edge of the phyllo section with melted butter and fold over. Press to seal the edges as much as possible. minutes or until lightly brown and crispy. 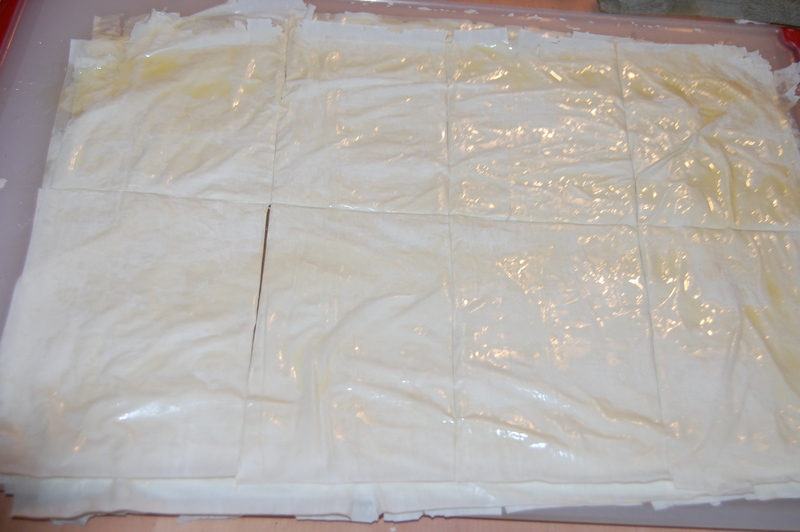 Repeat the process, building another 8 sheets of phyllo, cut, fill and fold. If you want to get fancy, you could make triangles. make it yourself by simmering a 1/2 cup of balsamic vinegar until it thickens. Add a scoop of vanilla bean ice cream and enjoy. Heavenly!! !